This enchilada sauce recipe will be requested often. Why? Because my homemade enchilada sauce from scratch makes good enchiladas - outstanding. See for yourself below; you will never buy it at the store again. This enchilada sauce recipe is worth it's weight in gold in this delicious Mexican dish. Photo above. For this recipe, I shred chicken by placing two forks back to back and pulling meat apart. Set the shredded chicken aside. Some folks like strips, it's up to you. Serve with Spanish Rice and sour cream. 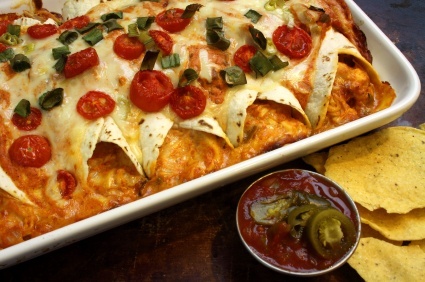 One of my favorite Mexican food recipes using my enchilada sauce recipe.